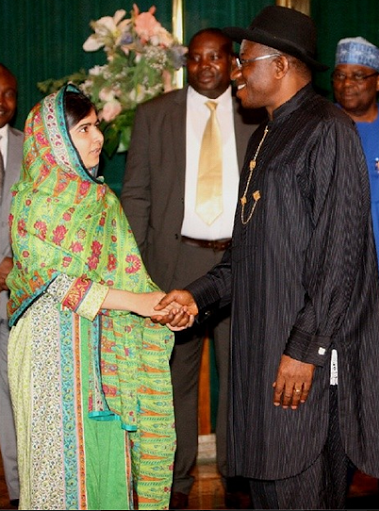 Yesterday, Child education advocate,Malala Yousafzai was in Nigeria and met with the President regarding theabducted Chibok girls..She also convinced President Jonathan to visit the parents of the kidnapped girls.. However Ali Baba believes there is nothing she said which Nigerians haven’t been saying for a long time..Agree? “I met with the parents of these girls who are still under the abduction of Boko Haram and they werecrying and hopeless. But still, they have this hope that there is still someone who can help them. They asked me if there is any chance for them to meet the President because at this time, they need the President’s support, so I asked the President if it is possible for him to go and see them to encourage them and the President did promise me that he will meet the parents of these girls. “I spoke to the President about the girls who complained that they could not go to school despitethe fact that they want to become doctors, engineers and teachers. But the government is not providing them any facility. They also need health facility, security and the government is not doing anything. ALSO CHECK: Rapper Rick Ross Got Lashed For Tweeting "Just landed in the country of Africa"
« How Many Men Are Willing To Do This?